Earlier this month, I popped into Corkscrew in SE Portland for a glimpse (taste, rather) of the latest Whoa, Nelly! Pinot Noir by Anne Hubatch and HelioterraWines. I was in the spirit, cowboy hat in-tow, and damn if this delicious red didn’t knock my boots off. Nelly stands up as a bold, fruit-heavy blend and yet with brightness to it that I feel I’ve been lacking in my Pinot Noir, especially with the summer heat turning up the need for lightness and crisp. Originally released in March of last year, this ‘09 Pinot Noir was so sought after it sold out in only 5 weeks (now if you're a scavenger hunter of a wine buyer, Anne’s research indicates there might still be a few stray bottles of original hidden throughout Portland-area New Seasons markets). In a city awash with Pinot, it’s wines like Nelly that reel me back into Pinotland and allow such varietals back on my summer wine list. 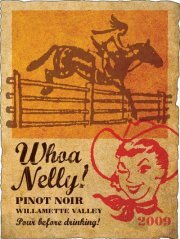 Whoa, Nelly is set to be released in early July and can be found at your local Whole Foods and/or New Seasons markets. At only $16, this Friday Find is a steal… plus, it’s a great excuse to wear that cowboy hat collecting dust in my errr, one’s closet. Helioterra Wines is a part of the PDX Urban Wineries troupe, a group of winemakers committed to making wine in the city. Stay tuned for more information about the SoutheastWine Collective, a new wine bar experience featuring PDX Urban Wineries, set to open in August on SE Division!